If you live on The High Path Estate, then your letterbox would have sighed with relief, as a letter with the dates for the next stage of consultations regarding the Residents Offer, is now out. It seems like an age since Circle Housing Merton Homes (CHMP) have had one of their sessions with the residents and this was due to the purdah before the General Election and also, their regeneration team consulting with their regional and national boards. In addition to news of these dates, the letter also tells us that between 11 -18 June 2015 there will be an opinion survey by Membra, who are an independent research and survey agency. This Saturday 23rd May 2015, you are warmly invited to share your stories of the past at Merton’s Heritage Department. wartime bi-plane; create a Remembrance poppy or colour wartime characters. during the First World War, whether as combatants, war workers, conscientious objectors or wartime refugees. NOTE: Café Gusto will be serving a range of food and drinks throughout the day. range of wartime records and memorabilia. volunteers about their research into Merton’s wartime history. This short illustrated talk will give an insight into life before the Great War. this illustrated talk will give an insight into life in Merton during the First World War. Earlier this year, on a cold sunday morning we, at High Path estate, visited the other estates that were chosen for a proposed regeneration – Eastfields was first up, then Ravensbury. It was a casual, fact finding mission and it was clearly noticeable that the estates need more than a lick of paint. What was most evident, in Eastfields’ case especially was the strong bond that they had with their local surroundings. The Ravensbury estate sits between the green and splendid Ravensbury Park and equally proud, Morden Hall Park. Eastfields’ charm, however, is different. The site is not as close to a vast, green and pleasant land: Mitcham Common is a steady 15 minutes walk away from the outskirts of the estate. So, for the youth of today and leaders of tomorrow on Eastfields estate – what to do? Build something for our young people to be challenged by was most probably what somebody said. On our visit we could see an adventure playground but more challenging is a BMX track managed by, Merton Saints BMX. The track is housed within the estate and it shows that when a facility is maintained and loved by local people, it can produce a positive outcome if honed and nurtured in the right way. Gone are the days of the 80’s when BMX riding was for the disenfranchised and sulky delinquent (not that that is necessarily a bad thing). Now in this new era, we see sponsorship deals awarded to the professional riders; and with an added injection of progression, the sport has been globally recognised and is notably an Olympic event (since 2008). Merton Saint BMX demonstrates that with the support of funding, and, the guidance of experienced coaches what can be achieved if an outlet is allowed to prosper and healthily encouraged. So without further ado we should all extend our hearty congratulations to the coaches, riders, parents and guardians connected to Merton Saint BMX as we applaud fresh news that was released recently. Eleven of their riders have been selected for the World Championships, 21-25 July, in Belgium. Yes, eleven riders! Not one or two token wins from a small group, but eleven strong and brave athletes, determined to take their skills to the global stage. The level of strength required to maintain a strong body position whilst landing from performing a trick in the air, with a bike, is immense. The level of bravery and courage to even contemplate such a feat is equally as high. The opportunities that this gives to the people of Eastfields are too many to mention and amongst these are the transferable skills you can take into other walks of life – regular bike maintenance, for example, is a key component that riders must master to enable their two wheeled instruments to elevate them to those dizzy heights, a loose nut out of place will land you in A&E very quickly! To add to this, statistics have shown that as a sport it is one of the most inclusive and calorie burning activities for people to pursue – surf boarding, snowboarding, and downhill skiing are just a few of the other non contact/combative sports that achieve the equivalent fat burning levels but crucially training or competing at these events comes with a significantly higher burden, in financial terms. In an age where the computer is king/queen and opportunities are few and far between for people to extend themselves appropriately, it is heartening to see this group go beyond the norm and excel where others might have written themselves off. Take a bow Eastfields: onwards and upwards. 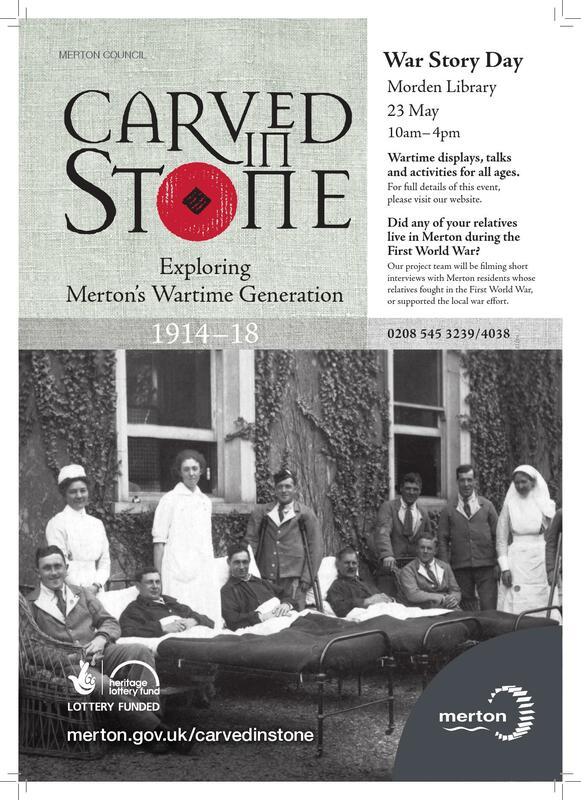 As part of the Carved in Stone project, we will be staging a number of War Story Days where volunteers will film short interviews with Merton residents whose relatives fought in the First World War, or supported the local war effort. If you have family stories that you would like to share, or wartime memorabilia that we can record for posterity, we would love to hear from you. The War Story events will also feature a range of talks, photographic displays, children’s crafts and access to wartime documents and objects. War Story Day 1: May 23rd, 10am – 4pm. Morden Library, Merton Civic Centre, London Rd. Morden. War Story Day 2: June 20th, 10am – 4pm. Acacia Centre, Grove Road, Mitcham. War Story Day 3: August 1st, 11am – 5pm. Wimbledon Studio Theatre, The Broadway, Wimbledon.